Last week I was very fortunate to accompany my pal Steph on a Press Trip to Dubai! It was a very quick turnaround which required a new passport, summer clothes and booking in for all my essential pre-holiday appointments! I thought I would talk about what my holiday essentials are today! Bikini Wax - even for a city break I like to be groomed! I always head to the Brazilian Waxing Company for this as they are SO GOOD. LVL Lashes - Much as I love the look of lash extensions, I just can't deal with the reality so when I discovered LVL I was blown away. Nothing at all is added to your lashes in this treatment. Working with what you have naturally, the lashes are semi permanently lifted/curled round a miniature roller and then tinted, leaving you with a really natural, nice wide eyed look. An absolute MUST for holidays. Nails and Eyebrows - everyone loves a mani/pedi for hols and I am exactly the same. I always have a brow shape and tint aswell! Sunscreen - I absolutely adore the Bioderma Photoderm Bronze Dry Oil as it is probably the only thing that doesn't make me break out. 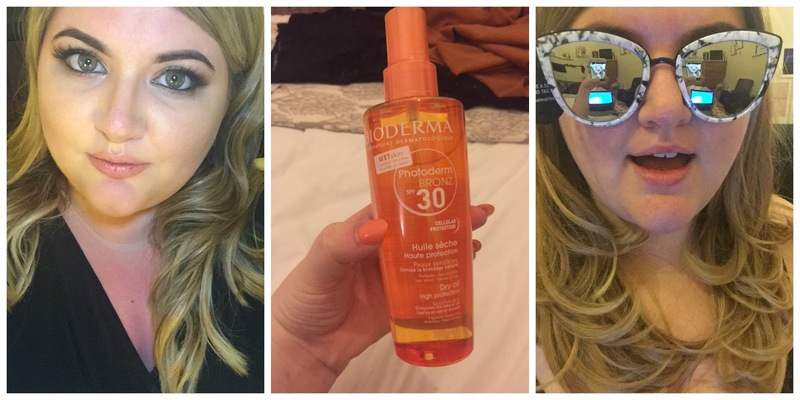 Last time I went to Dubai I used factor 50 and didn't burn at all (I literally ALWAYS burn) so I opted for factor 30 this time... unfortunately in that strength of sun I think I probably needed the 50 as I did catch the sun a little bit but I still swear by this product for anyone fair skinned! Sunnies - I never realised how important good lenses are on sunglasses until I won some Ray-Bans... I wanted another pair to add to my collection so I treated myself to some Quay Australia Sunnies from ASOS as I had heard really good things about them and the fact that their lenses are super high quality but a reasonable price! A slightly darker foundation is a must for me when I go on holiday, not because I get overly tanned but if I do catch the sun a bit then there is nothing more annoying that having a totally pale face compared to your neck/chest! I tend not to spend loads on one and my current fave is Bourjois Healthy Mix Serum in a slightly darker shade than usual. Salt Spray - my fave salt spray is the one and only bumble and bumble one for the perfect amount of hold and a lovely beachy texture for hair. When it's warm my hair tends to just get a mind of it's own so rather than spend hours trying to tame it I will just spritz, scrunch and hope for the best! As well as salt spray I also always make sure I take some super moisturising hair treatments with me as because I have got bleached ends of my hair it can get very dry in the sun. Summer Fragrance - I have two absolute fave fragrances, Estee Lauder Bronze Goddess and Laura Mercier Ambre Vanille. They make me so happy to wear them! Avene Eau Thermal Spray - this is a new discovery for me. I have read many bloggers rave about it so decided to pick up a bottle when doing my big beauty shop prior to going away! You can get a small size that is authorised for coming on board with you and after removing all of my makeup I periodically spritzed this on to ensure my face was well hydrated and it very much did the trick! Charlotte Tilbury Multi-Miracle Glow - this stuff is unreal. I usually break out on the plane as my skin goes nuts with over compensating on oil for how dry it becomes. I slathered on this as a mask and was left with the most amazing skin when we had landed! This will hands down be my new on-board skin routine as it really made the world of difference! It was also fab on the way back as I had a bit of a burned decolletage so just popped some of this on to avoid the dreaded peel! Hand cream - I'm not overly precious about brand but I have to put some on and make use of the downtime! Travel Pillow - I was very kindly treated to a gorgeous Ted Baker Travel Pillow and Eye Mask Set from Flamingo Gifts which was very much appreciated on my way to Dubai when I was super tired! Invisibobble: I normally try and do my hair before going on holiday or have a blow dry to in order to drag it out as long as possible I use these no bump bobbles to avoid the awful ridge you get with normal bobbles! What are your holiday must-haves? ?